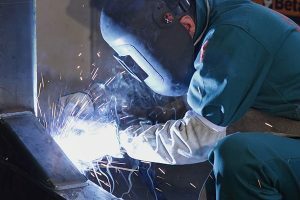 Educating employees about the potential for burn hazards in the workplace and what to do in the event of an accident are important steps in improving workplace safety. Taking actions to prevent burns from happening in the first place is the best defense against this workplace hazard. This includes training workers to be aware of burn safety protocols and identifying potential hazards. Since even the best preparations can’t prevent every accident, it’s important to have training in place for when bad things happen. Follow appropriate standard operating procedures (SOPs) and determine specific burn potentials in various parts of the workplace. Become familiar with chemical labels and safety data sheets to know the required Personal Protection Equipment (PPE) before working with a substance. Follow lockout/tagout procedures, wear appropriate clothing and PPE when performing electrical work. Chemical burns – Occur when substances create a chemical change in a person’s skin with or without heat production. These types of burns continue to damage tissues until the reaction is complete or the chemical is flushed away. Electrical burns – Occur when an electrical current traveling through the body meets resistance from tissues and generates heat burn injuries. Thermal burns – Occur as a result of exposure to fire, steam, hot surfaces or liquids hotter than 115 degrees. Chemical burns – Immediately remove any contaminated clothing, brush off loose powders and flush the area with water for at least 20 minutes. If the eyes are affected, flush with clean water from a low-pressure source while keeping eyes open. Cover with dry, sterile, nonstick dressing and seek immediate medical attention. Electrical burns – Turn off the power and secure the scene. Do not approach or touch the injured person until you’re sure the power is off. Check the victim’s breathing and heartbeat, begin CPR if necessary, and call for immediate medical attention. Thermal burns – Have the victim stop, drop and roll if clothing is on fire. Smother the flames with a blanket or douse with water. Assess the severity of the burns and call for immediate medical attention. Do not apply cold water to second- or third-degree burns. Burns are categorized into three general levels of severity. First degree – Painful, but superficial, the least-severe burns are red, dry and blanch when pressed upon. Second degree – These can range from superficial burns to those creating blisters. Depending on the severity of the injury, these painful injuries can be red and wet or white and dry. Third degree – The most severe burns result in destroyed tissue and often require skin grafts to heal. For more information about preventing and treating burns in the workplace, please call Beth Keller, business liaison, at 573-331-3959.